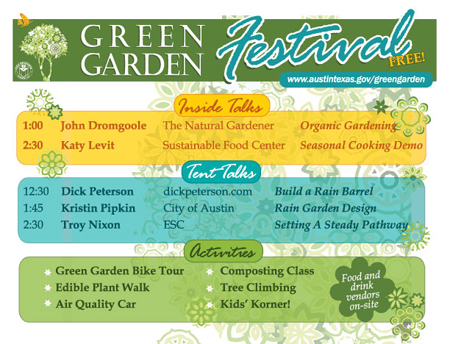 I’ll be volunteering for the City of Austin’s Green Garden Festival, and I hope to see you there. Check out the information below for some details about what is planned. And yes, it is FREE!! You’ll find talks and tips to help you create and maintain a yard that is attractive, cost-saving AND earth-friendly. The festival will feature a fun, hands-on Kids’ Corner so don’t forget the kidos. Enjoy a fun day in the park for adults and kids while learning how to have a beautiful yard and a clean environment. Bus Routes: Route 30 serves Zilker and Routes 21/22 drop near Deep Eddy. Visit the Capitol Metro Trip Planner and Map Your Route! Parking for Cars: At the polo fields across the street from the Zilker Botanical Garden. (In case of rain, alternative parking and shuttles will be available.) Bicycle and special needs parking will be available in the Zilker Botanical Gardens parking lot.